"Let's just say we're doing it for a pal in the army." Manufacturer: Panasonic Disc Services Corp.
Hollywood filmmakers have long known that a hit song can often form the basis of a hit film. Not surprisingly, what was for many years the biggest popular hit song of all time made for a sizable hit film in 1954. 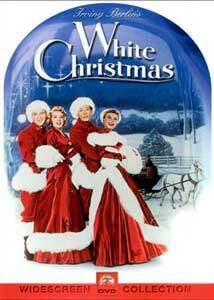 White Christmas (based on a song introduced in the film Holiday Inn) is also a surprisingly good film, in no doubt part to the A-list cast and crew (it was directed by Michael Casablanca Curtiz) and a raft of great Irving Berlin songs. Bing Crosby stars as popular singer Bob Wallace. The opening sequence finds Wallace in the army (always fertile ground for Berlin's songwriting talents) during WWII, where together with Private Philip Davis (Danny Kaye), Wallace is putting on a combination Christmas show (complete with the title song) and farewell to their beloved commanding officer, Gen. Waverly (Dean Jagger). When a bomb hits, Davis saves Wallace's life, and extracts from him a promise that after the war Davis will get a shot at teaming up with him on stage. They eventually become a huge hit. When they meet two musical sisters, Betty and Judy Haynes (Rosemary Clooney and Vera-Ellen), romance seems to be in the cards. Over a Christmas break, they travel to Vermont for the snow and a gig at a ski lodge. Alas, there's no snow and the lodge is deserted. Lo and behold, this disaster of a ski lodge is owned by none other than Gen. Waverly. Bing and friends concoct a scheme to help the general out and let him know he's remembered fondly by his men, but not before busybodies involve themselves and threaten to not only mess up this plan, but the romances too. The film has a goodhearted feeling to it, tied in closely with loyalties and respect that one doesn't see in movies any more. Part of this is no doubt tied to different attitudes toward the citizen army with a clear goal of World War II vs. the professional army with more nebulous objectives of Vietnam and other wars. Berlin's score, though heavily sentimental toward the military, is surprisingly restrained in its jingoism. As Clooney notes in the commentary, this film almost felt as if it was a tying up of loose ends from the war; although the boys had been home for a while, the sentiments of the holidays and being back with the family were nicely pulled together in the title song. Crosby as always essentially plays himself, the deceptively easygoing workaholic and perfectionist. Kaye offsets Crosby nicely as a teammate. His comedy, singing and dancing skills (he literally dances rings around Crosby) are well suited to the tone of the film. Clooney is a better singer than she is an actress, but both she and dancer Vera-Ellen are better than tolerable as female interests. Clooney in particular is sharp and seductive in her big number, Love Didn't Do Right By Me. Jagger is effective as the gruff-but-lovable cliche, and character actress Mary Wickes really shines as Waverly's aggressively nosy housekeeper. While at first blush the film has a "let's put on a show, kids," air reminiscent of a Garland-Rooney opus, the fact that these are professionals with connections is emphasized, as is the fact that the undertaking is difficult, expensive and requires extensive coordination and rehearsal time. Many of the musical numbers are seen primarily in rehearsal; where we see the finished number the difference is often astounding. The Berlin songs (the title song opens and closes the film) are in general well selected and suitable (although Snow is quite insipid and painful to listen to more than once); Berlin wrote three new songs for this score, as well as supplying classics such as Blue Skies which is unfortunately presented in rather truncated form. All in all, an irresistibly uplifting and feel-good experience that's recommended for family holiday viewing. Image Transfer Review: Paramount has done a terrific job of restoring and presenting this gem, notable as the first Vistavision release. The anamorphic picture is sharp and clear, without visible artifacting. Black levels are excellent and colors are vivid without being oversaturated. Video bit rates run quite high 7-8 Mbps throughout. Although the Paramount logo at the beginning suffers from a bit of flicker, the film itself looks gorgeous. Not a spot or speckle was visible anywhere during the presentation. Audio Transfer Review: The sound is also restored, and although it's not as stellar as the video presentation, this is as good as this film is likely to ever sound. The 5.1 remix is not directional in the least, but it does provide a satisfyingly broad soundstage and nice depth. Crosby's mellifluous voice comes out wonderfully on this track, with a resonance that makes one clearly understand why he was as popular as he was. Paramount also thoughtfully presents the original mono track (which sounds rather thin and less satisfying) for the purists. Both audio tracks have a somewhat dated, clipped sound to them, but that's clearly a failing of the source material, not of the transfer. The French mono track is comparable to the English one. Extras Review: Who would have thought that it would be Paramount of all studios to be one of the first to give us a special edition (though not called such) of an old-time musical? This disc features an interesting commentary track with the only surviving major cast member, Rosemary Clooney. Although she starts off very slowly (there's little comment at all in the first ten minutes), she warms to the subject and begins reeling off many fond anecdotes about the filming, her co-stars, the Edith Head costumes, etc. Towards the end she begins slowing down again, going for long stretches where she's just watching the movie and laughing. She clearly has great affection for this film, however, and despite the slow spots it is a joy to listen to. The other extras are a 16m:42s on-camera interview with Clooney (which covers some of the same ground as the commentary), the original theatrical trailer and a re-release trailer. While not a fabulous package, it's much better than the barebones treatment that many movie musicals have gotten on DVD thus far. Here's a good model for others to follow. Chaptering is unfortunately inadequate; there aren't enough chapters and the songs are maddeningly not given their own chapters. Subtitles are in easy-to-read yellow and are unobtrusive. A nice little Special Edition of a heartwarming Berlin musical, with a vivacious cast and crisp direction. Highly recommended for holiday family viewing.